WhatsApp has generally been seen as a safer social media option for children. However, schools are increasingly reporting that the platform is a source of problems, particularly with younger children. This page aims to provide parents and carers with sufficient information to ensure they are aware of the risks that come with the app, and steps that can be taken to reduce these risks. The information in this post can also be accessed and shared through our WhatsApp info sheet for parents and carers. Click the image to the right to download this file. WhatsApp is a free messaging app. It allows you to send text and multimedia messages (video, images and voice recordings) to people in the contact list on your phone. It also allows users to set up group chats where the administrators can invite up to 256 people to share messages and images publicly within the group. Although the age limit for WhatsApp was recently raised to 16 it is popular with primary age children and above. So what are the risks? Group administrators can invite people your child does not know into group chats. Some of these people may not have innocent intentions or may be older and post age-inappropriate messages. Some WhatsApp groups can contain images and messages which can cause distress to children. These might include violent images or videos, abusive messages and sexual content. Chain messages are often shared through WhatsApp. These pressure children to post them on to their contacts, e.g. by claiming that failure to do so can result in the child or a family member dying. Many children find such messages distressing but also feel they must share them with others due to fear of the threat. WhatsApp does not allow users to decide whether to join a group. Your child will be automatically added to any groups that their contacts add them to. If your child leaves the group the administrator can add them straight back in. 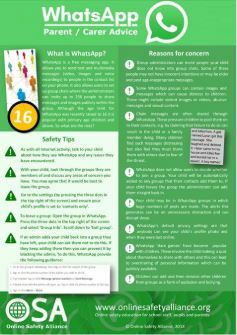 Your child may be in WhatsApp groups in which huge numbers of posts are made. The alerts this generates can be an unnecessary distraction and can disrupt sleep. WhatsApp‘s default privacy settings are that anybody can see your child’s profile photo and when they were last online. WhatsApp ‘dare games’ have become popular with children. These involve the child making a quiz about themselves to share with others and this can lead to oversharing of personal information which can be publicly available. Children can add and then remove other children groups as a form of exclusion and bullying. Children can add and then remove other children from groups as a form of exclusion and bullying. With your child, look through the groups they are members of and discuss any areas of concern you have. You may agree that it would be best to leave the group. Go to the settings (by pressing the three dots in the top right of the screen) and ensure your child’s profile is set to ‘contacts only’. To reduce impact on sleep, avoid allowing your child to have their phone in their bedroom at night or go to the WhatsApp settings and turn off notifications. To leave a group: Open the group in WhatsApp. Press the three dots in the top right of the screen and select ‘Group Info’. Scroll down to ‘Exit group’. If an admin adds your child back into a group they have left, your child can ask them not to do this. If they keep adding them then you can prevent it by blocking the admin. To do this, WhatsApp provide guidance here. It should be noted that taking this step fully blocks that individual so you will no longer be able to communicate with them at all through WhatsApp.